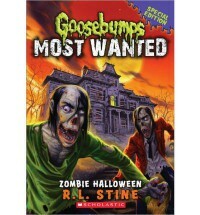 This is a decent zombie book written by RL Stine. It is a bit gory, so if your kid is squeamish I wouldn't let them read this particular Goosebumps. Overall this book was good, but I want to point out it started in 1944 with the grandpa and zombies back then were voodoo zombies, not flesh eaters. Just a nitpick! The book was quite humorous as RL Stine is a good kid's writer. I would say if your kid likes zombies, go ahead with this one.